Snow is sloooooowly moving in from the west tonight. It is about on time from what I was thinking earlier. I figured it would start to move into our western/northwestern counties of SE Missouri starting around 10:00pm CT. I took a look at the Rapid Refresh model (yet another model to gaze). The model is run every hour. Here is the model's depiction of what the national composite radar will look like at 1:00am CT Tuesday. 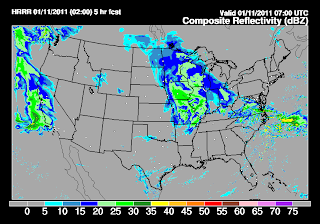 It is bring the snow through overnight (as expected). 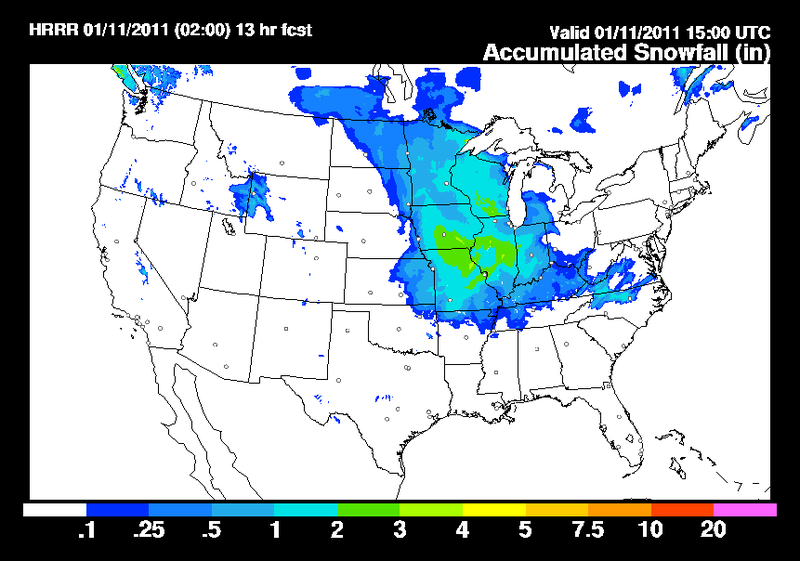 One thing the Rapid Refresh model is hinting at is lower snow totals. 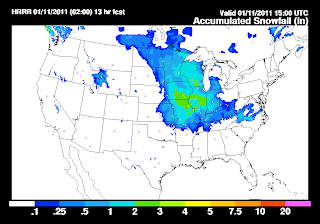 Here is the 2z model's accumulated snowfall through 9:00am CT Tuesday. A reminder about a couple of new blog features. Look to the top of the page and you will see tabs for "Blog", "Radar" and "Watches & Warnings". If you click on the Radar tab you can look at a new interactive radar and if you click on "Watches & Warnings" you can go to an interactive map plotting active watches and warnings for the country. I live about 13 miles SSW of Poplar Bluff. I WANT SNOW!!!!! How is that Sunday Snow looking??? Will it be any kind of Accumulating snow?